Over 600 riders tackled the famous Three Peaks race on Sunday, but Rob Jebb came out on top for the eleventh year. Here's a short post from our rather tired team who also raced and were a sponsor of this incredible race. Above: The men's podium (left to right): Nick Craig (2nd); winner Rob Jebb (and children); and Joe Moses (3rd). Below: Ian Taylor's amazing descent of Ingleborough - the fastest of the day by some 40 seconds. 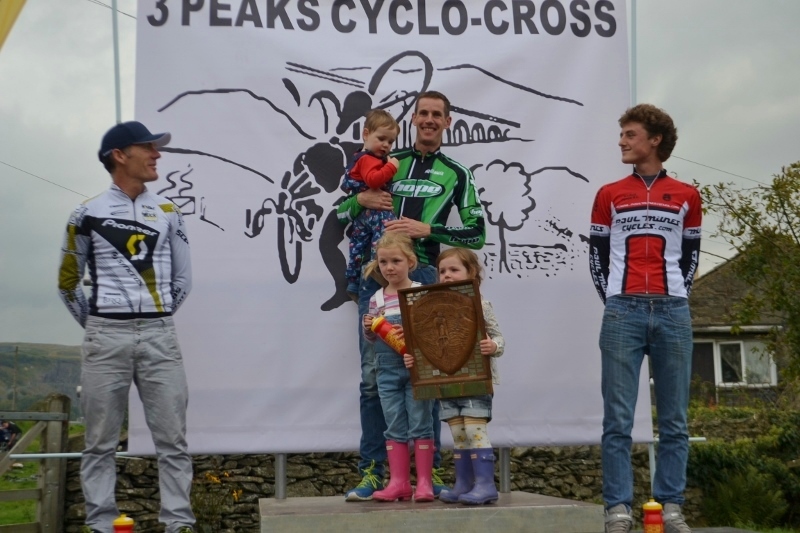 CROSS and fell running international Rob Jebb won his eleventh Three Peaks title yesterday (September 28th) over the three famous Yorkshire mountains and Verity Appleyard was a new winner in the women's race. Weather conditions were ideal for the 600 plus starters with mild temperatures and little wind and the winners took home £700 each as first prize. Yorkshireman Jebb led immediately onto the off-road at Gill Garth and proceeded to open up his customary lead by running much of the lower slopes of Simon Fell. Jebb punctured descending the first peak of Ingleborough, but with support on the lower slopes he did not lose much of the two minute lead that he had already established over under-23 rider Joe Moses, previous winner Nick Craig and veteran Ian Taylor. Taylor was the fastest coming off Ingleborough and his amazing descent, passing Moses and Craig on the way, can be seen on his own camera footage (above) - he eventually finished in fifth place, as well as second veteran, a member of the winning team and also winning veteran's team. Three-time winner Nick Craig overhauled Moses later in the race, but had to settle for second place again, about three minutes down on Jebb. British 'cross international Moses held third place and with it the under-23 prize - a great result in only his second attempt at the race. Moses had an amazing escape, on the descent of the final peak, as his fork steerer tube snapped and he was forced to run on to take a replacement bike in Horton. Craig's descent of Penyghent was also not without incident - he collided with a climbing rider in the race and fell on a hard, stone section. Luckily neither rider was badly injured and Craig was soon back on his bike. We hope to have more words and photos from the Peaks once our team have fully recovered from the race! The womens podium: (l-r) Sarah Barber (2nd), winner Verity Appleyard and Maddy Robinson (3rd). A podium full of multiple Peaks winners. Left to right: Nick Craig (three wins); Tim Gould (six); Eric Stone (five); and Rob Jebb who won his eleventh yesterday. Off-road legend Keith Bontrager (USA) completed the race for the sixth time and finished second in his age-group. British cyclocross legend Eric Stone was visiting from Australia. Eric won the race five times between 1971 and 1982. Cyclocrossrider bidons containing prize money amongst the race silverware. Five riders representing Cyclocrossrider.com finished the Peaks on Sunday resplendent in Bioracer Sprinter jerseys. Well done to all!